Why most customer support organizations would like to strangle their engineering teams, part 77,432... This morning we received an electric heater that we bought to warm up our sun room in the winter. The room is built with double-pane glass, but there's no heat to it, so the cold seeps in anyway. 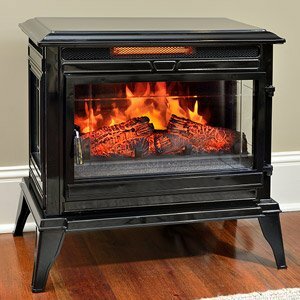 We got one that resembles a wood-burning stove, complete with “flames” and glowing embers. The photo at right is the store photo of the model we got. Naturally, it was a kit, though it was an easy one: I just had to screw 12 screws into the four short legs. I put it on its legs, turned the power switch on in the back, and started test it. I could turn the front-panel power button on and off, control the timer function, and adjust the brightness of the fake flames and embers – but when I tried to set the temperature, I just got an “E3” in the numeric display. I figured that was an error code, so I read the manual from front-to-back trying to find it. No luck. Then I called the manufacturer's service number (to their credit, prominently written on the manual) and got a recording saying they'd get back to me within a day. I left the requested message and figured I'd be lucky if I heard from them within a week, given the season.